Germany and France scrambled to avoid a major split over Greece on Monday evening as the eurozone delivered a damning verdict on Alexis Tsipras’s landslide referendum victory on Sunday. 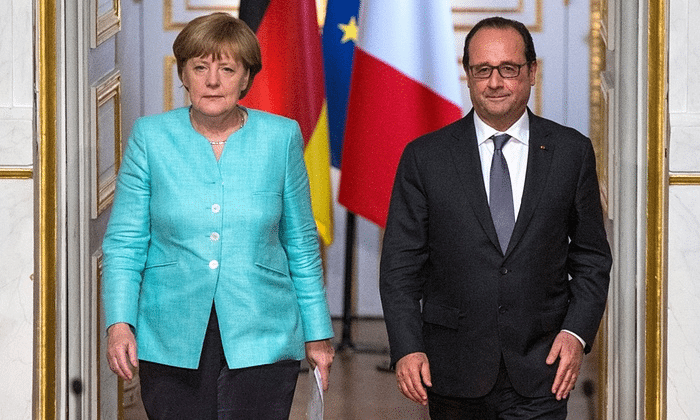 Angela Merkel demanded that the Greek prime minister put down new proposals to break the deadlock. As concerns mount that Greek banks will run out of cash and about the damage being inflicted on the country’s economy, hopes for a breakthrough faded. EU leaders voiced despair and descended into recrimination over how to respond to Sunday’s overwhelming rejection of eurozone austerity terms as the price for keeping Greece in the currency. Tsipras, meanwhile, moved to insure himself against any eventuality to topple him and force regime change by engineering a national consensus of the country’s five mainstream parties behind his negotiating strategy, focused on securing debt relief. Tsipras also sacrificed his controversial finance minister Yanis Varoufakis, in what was seen as a conciliatory signal towards Greece’s creditors. As eurozone leaders prepared for today’s emergency summit in Brussels , the heads of government were at odds. France, Italy and Spain are impatient for a deal while Germany, the European commission and northern Europe seem content to let Greece stew andallow the euphoria following Sunday’s vote give way to the sobering realities of bank closures, cash shortages and isolation.